How does the Gentle Leader work? 1. The Gentle Leader's custom nose loop fits around the dog's muzzle and applies light pressure much like a lead dog would do to a lower rank animal in the pack. The dog immediately understands its place in the hierarchy of your household and recognizes you as the leader. 2. The Gentle Leader can be custom fit to your dog. (We can help!) Once the headcollar is fitted properly, dogs can comfortably wear them for up to 16 hours, without being able to remove it on their own. 3. When properly used, the Gentle Leader headcollar can prevent such unwanted behaviors as leash pulling, lunging, jumping, chasing, digging, begging and much more! 4. It is User Friendly!!! The Gentle Leader kit has easy to follow instructions with a great training DVD. 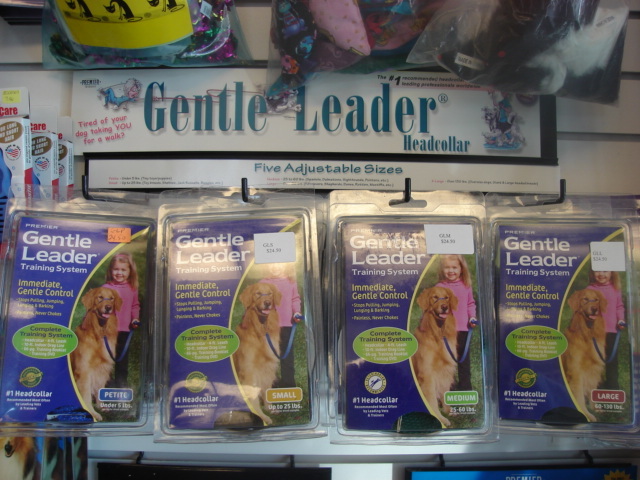 Plus, any one of our Certified Veterinary Technicians would be happy to help you start using the Gentle Leader today!